Fate: scheduled to be dismantled. named after and in honor of the Battle of Yorktown (American Revolution) – 1781. USS Yorktown (CG 48) cruises the Caribbean Sea towards Colombia, South America, February 24, 2002. 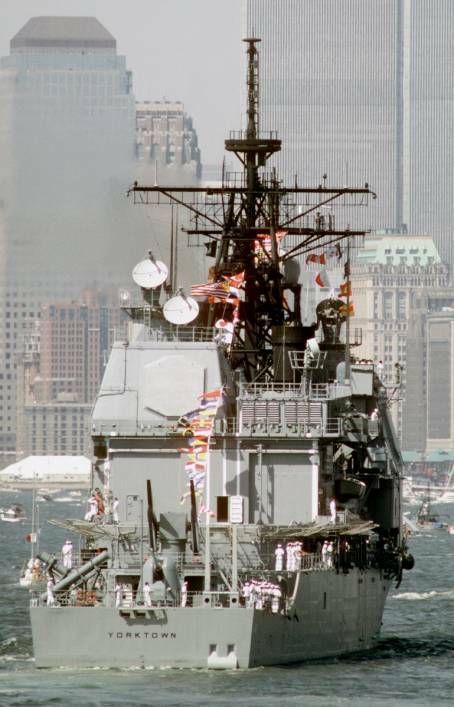 A starboard quarter view of the guided missile cruiser USS Yorktown (CG-48) with the New York City skyline in the background. 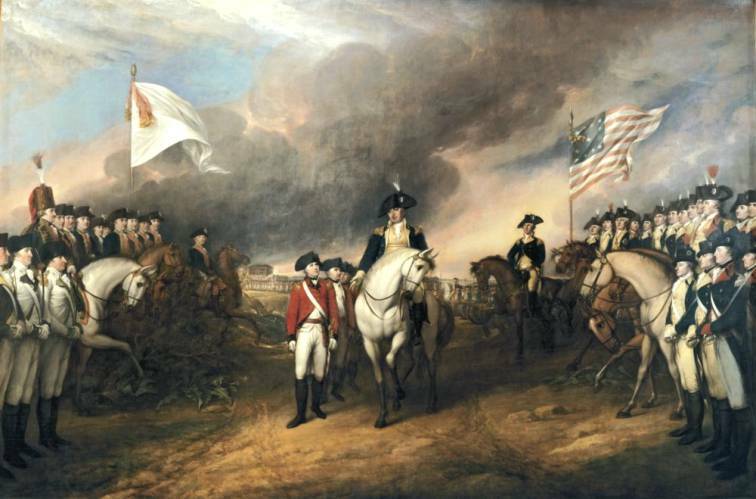 Surrender of Charles Cornwallis at Yorktown - by John Trumbull, painted 1797. The campaign was the culmination of cooperation between France and the young United States, without which the outcome of the revolution would certainly have been jeopardized. In the summer of 1781 Washington hoped to employ the French army under the Comte de Rochambeau, which had landed at Newport in 1780, in a joint expedition against New York City. Washington hoped to use the French West Indian fleet under the Comte de Grasse in the campaign as well. Meanwhile British troops in Virginia under Lord Cornwallis and Benedict Arnold, which had been gathered into a strength of about 7000, established a base at Yorktown where Cornwallis could maintain open communications with the British army in New York under General Clinton. When Washington was informed that the French fleet would be available for operations in the Chesapeake area, and that Cornwallis was in Yorktown, he changed his objective from new York to Virginia. Washington began to march his army and Rochambeau's troops to Virginia, but at first he deployed his army in a manner that seemed to threaten New York to disguise his true intentions. While he was marching southward de Grasse's fleet arrived off Yorktown and fought a sharp battle with the royal navy under Admiral Thomas Graves, causing Graves to retreat toward New York. Washington and Rochambeau's armies, which in combination heavily outnumbered the British, began the siege of Yorktown in late September, 1781. As Cornwallis shortened his lines, Washington's forces dug their way in closer and began pounding Cornwallis's Yorktown defenses with heavy artillery. After an assault led by Colonel Alexander Hamilton had captured two strong points on the British line, and with the French rather than the Royal Navy off the coast, Cornwallis found himself in a hopeless position, and he opened negotiations with Washington. The formal terms of the surrender were signed, and on October 19, 1781 the British army laid down its arms. A week later General Clinton arrived with reinforcements for Cornwallis, but it was too late. With the British having lost an entire army as well as having suffered defeats at sea to the French navy, Parliament decided not to prosecute the war any further and authorized the British government to begin to negotiate a settlement with the Americans. Lord North resigned, and peace talks began in Paris in April, 1782. American negotiators led by John Jay, Benjamin Franklin and John Adams negotiated a settlement that eventually led to the formal recognition of American independence with the Treaty of Paris. The victory at Yorktown had sealed the revolution once and for all and ended British rule in North America. 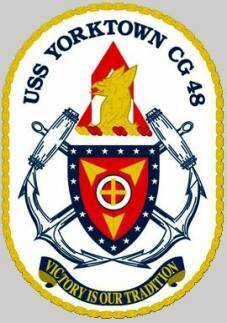 Yorktown received the Atlantic Fleet's "Top Gun" award for outstanding Naval Gun Fire Support (NGFS) in 1987. 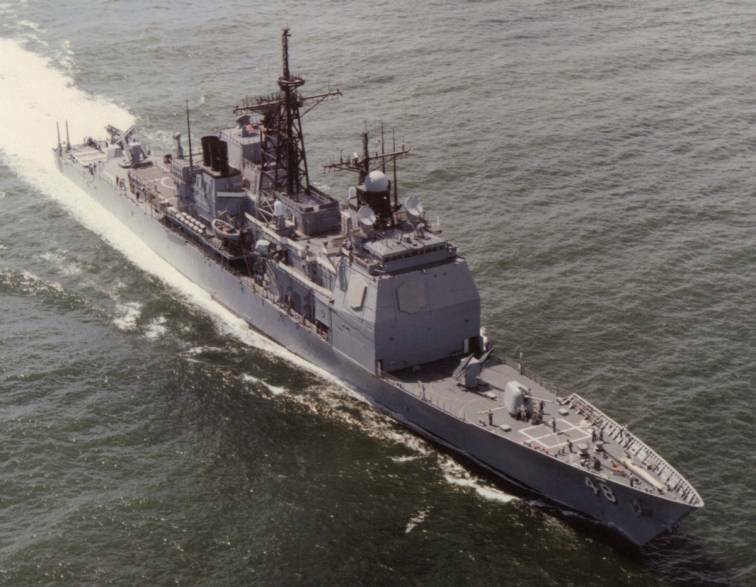 During the second deployment from September 1987 to March 1988, Yorktown participated in numerous U.S. and NATO exercises, as well as multi- national exercises with Morocco, France, West Germany, Tunisia, and Turkey. It was on this Mediterranean deployment that Yorktown gained worldwide publicity from operations conducted in the Black Sea as part of Freedom of Navigation program. On 12 February 1988, while exercising the "right of innocent passage" through Soviet territorial waters (a transit which, from an operational standpoint, was not necessary), a Soviet warship "Bezzavetniy" (Russian: "Беззаветный", project 1135) intentionally collided with Yorktown and pushed it out of Soviet territorial waters in what some observers have called "the last incident of the Cold War. In 1991, Yorktown was awarded the coveted "Old Crow's" award for Electronic Warfare excellence. In 1992 Yorktown was honored with the Marjorie Sterrett Battleship Fund Award for superb, sustained combat readiness. Yorktown served as a stabilizing force during her third and fourth Mediterranean deployments as the world watched the end of the Cold War and the tremendous coalition victory in Operation Desert Storm. 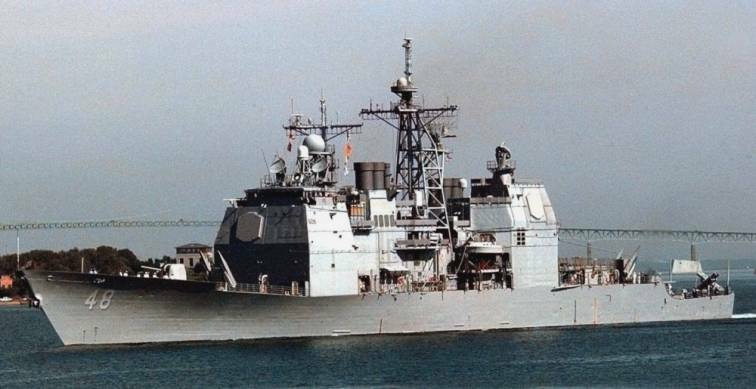 During the latter of these two deployments Yorktown participated in the first U.S. military exercises with the Romanian and Bulgarian navies, and played a key role in Operation Provide Comfort, which provided humanitarian relief and security for the Kurdish refugees in northern Iraq. In the summer of 1992, Yorktown participated in BALTOPS '92. During this cruise, Yorktown made a highly acclaimed port visit to Severomorsk, Russia, becoming the first U.S. ship to visit that port since the end of World War II. In 1993, Yorktown was awarded the Commander, Naval Surface Forces, Atlantic Ship Safety Award for a superior safety record. Yorktown has also been awarded two Navy Unit Commendations and a Meritorious Unit Commendation, and is a four-time winner of the coveted Battle Efficiency "E". 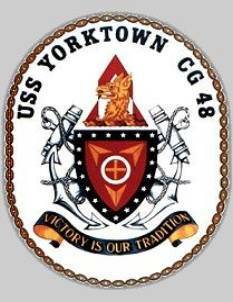 Yorktown served as Flagship for Commander, Task Group 4.1, during Counter-Drug Operations in the Caribbean in May - July 1993. In August 1993, Yorktown participated in the joint military Exercise Solid Stance in the North Atlantic. Yorktown's operations through the end of 1993 included an October - November excursion to the Caribbean to support the United Nations embargo of Haiti. In April - May 1994, Yorktown returned to the Caribbean as Force Air Warfare Commander during joint Exercise Agile Provider. While in the Caribbean, Yorktown served as Flagship for Commander, Destroyer Squadron Six, coordinating a six ship, twenty-six missile exercise. 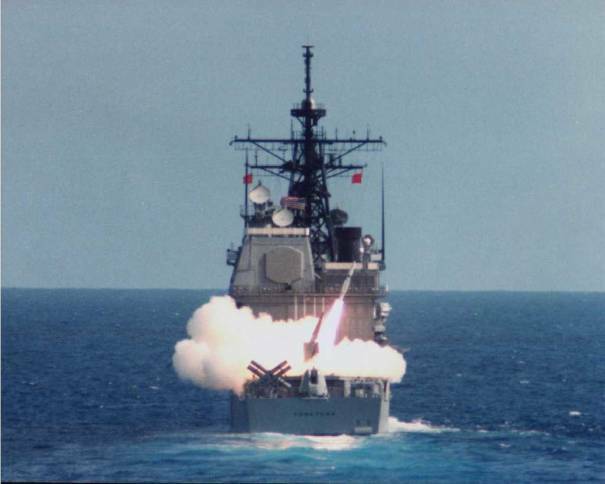 In the Summer of 1994, Yorktown achieved a resounding score of 101 during Naval Gun Fire Support (NGFS) qualification. 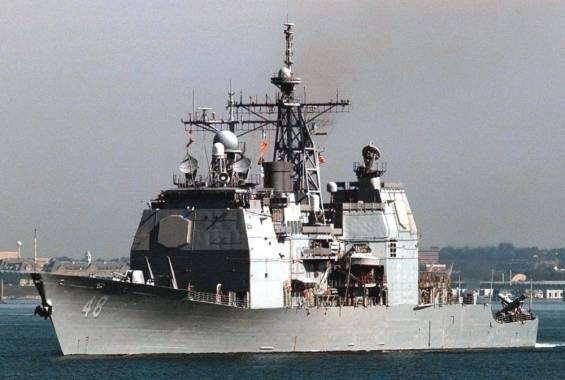 In August 1994, Yorktown set sail for the Adriatic Sea as Flagship for Commander, Standing Naval Forces Atlantic in support of United Nations embargo of the Federal Republic of Yugoslavia. During this six month deployment, Yorktown served as the Air Warfare Commander for the Adriatic Sea, participating in a joint task force of ships from the United States and eight European nations. In May - June 1995, Yorktown proceeded south to serve as Air Warfare Commander for the Caribbean Sea in support of Counter-Drug Operations. In December 1995, the Smart Ship Project Office was created and USS Yorktown was chosen as the prototype Smart Ship. The Smart Ship Program aims at reducing manning while maintaining readiness through technological installations and philosophy changes. The core technologies installed in Yorktown are a 16 workstation fiber optic Local Area Network (LAN), Integrated Bridge System (IBS), Voyage Management System (VMS), Damage Control System (DCS), Integrated Conditioning and Assessment System (ICAS), HYDRA wireless communication system, and Standard Machinery Control System (SMCS). In September 1996, Yorktown changed home ports from Norfolk, Virginia, to Pascagoula, Mississippi, after being tasked primarily with supporting operations in the Caribbean and South America. In May 1997, Yorktown (with a reduced crew aboard) completed a five month Counter Narcotic deployment in the Caribbean followed by test operations with George Washington and her carrier battle group. 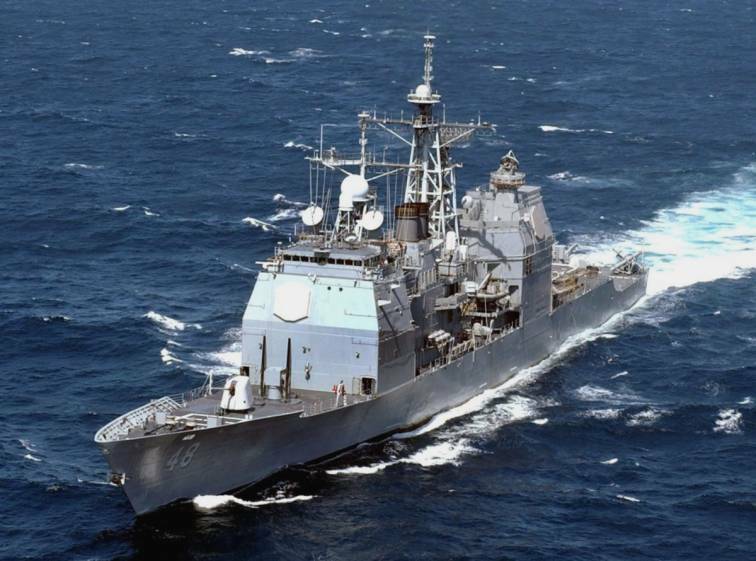 During these periods Navy Manpower and Analysis Center (NAVMAC) conducted a detailed review of manpower requirements, and Operational Test and Evaluation Force (OPTEVFOR) verified the ship's ability to meet all Required Operational Capabilities in the Projected Operating Environment (ROC/POE) doctrine for Ticonderoga-class cruisers. 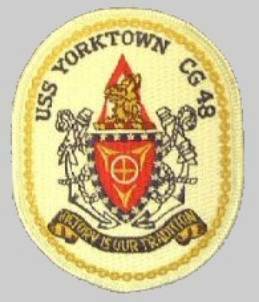 On 25 September 1999 Yorktown departed Pascagoula for a four month Counter Narcotics Deployment in the Caribbean. Before beginning patrolling efforts, Yorktown embarked staff members from COMSECONDFLT. Supported by the helicopter detachment, the Second Fleet staff surveyed and photographed another island slated as a potential replacement for training exercises if the Navy is unable to continue at Vieques Island, Puerto Rico. The ship made port calls in Jamaica; Aruba; Cartagena, Colombia; Rodman, Panama; Manta, Ecuador; and Cozumel, Mexico. In 2000, the ship underwent a dry dock maintenance overhaul in Mobile, Alabama. 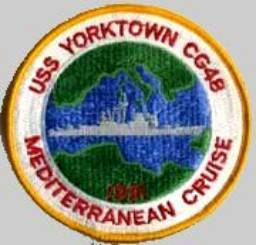 As of late 2001, and since commissioning, USS Yorktown had completed five Mediterranean deployments. The cruiser was last homeported in Pascagoula, Mississippi. Yorktown was decommissioned on 3 December 2004. As of 2008, Yorktown was scheduled to be dismantled in the next five years along with her sisters Vincennes and Thomas S. Gates. Since her decommissioning Yorktown has been berthed at the Naval Inactive Ships Maintenance Facility, Philadelphia, Penn. From 1996 Yorktown was used as the test bed for the Navy's Smart Ship program. The ship was equipped with a network of 27 dual 200 MHz Pentium Pro based machines running Windows NT 4.0 communicating over fiber-optic cable with a Pentium Pro based server. This network was responsible for running the integrated control center on the bridge, monitoring condition assessment, damage control, machinery control and fuel control, monitoring the engines and navigating the ship. This system was estimated to save $2.8 million per year by reducing the ship's complement by 10%. In 21 September 1997 while on maneuvers off the coast of Cape Charles, Virginia, a crew member entered a zero into a database field causing a divide by zero error in the ship's Remote Data Base Manager which brought down all the machines on the network, causing the ship's propulsion system to fail.